This might be the first time I have read in one of these vintage QST magazines about computers capable of talking - or about computers at all for that matter. There are those who say that the present-day radio amateur is little more than an "appliance operator" who is unable or unwilling to understand the toys he plays with. They point out, for instance, that the emergency communication aspect of our activities has been withered by the blast of mobile CB units and imported Walkie-Talkies. They equate the educational aspect of a modern ham station with that of a color-TV set; each can provide some measure of mental upgrading, perhaps, but unless you are a sponsor or manufacturer, there is little lasting benefit. At the drop of a jaw, these malcontents will conclude that since, to their knowledge, modern hams have been technically euchred out of the invention field, their utilitarian import is approaching zero, that they occupy commercially desirable spectrum space, and, therefore, are not worth saving. 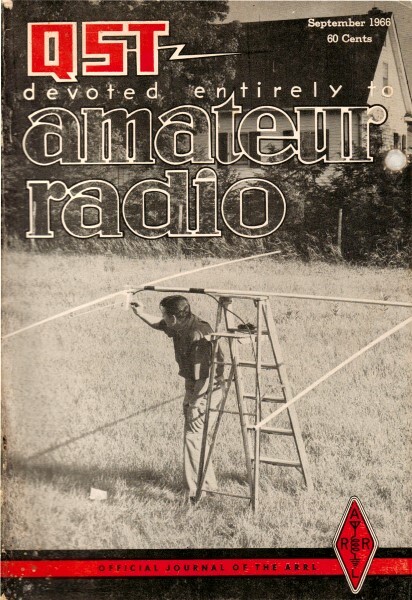 While these observations may have some truth buried in them, the point remains that the basic skill of amateur radio to establish and maintain communication continues to be forgotten. That one primary art form tends to be glossed over as a pseudo-science, or never observed in the first place. This accomplishment, call it Radiomanship, is cultivated, to some degree, in every active amateur. It is the skill, or necessary ability if you will, which separates the radio amateur from the citizen band and the commercial operator. It has little or nothing to do with one's ability to copy high-speed code or to acquire technical acumen; its growth is discrete from the amount of expensive equipment purchased for the shack, or text books studied for the mind. It is a communication awareness which is acquired by applied osmosis and requires continual contact with jam-packed ham bands and a flighty ionosphere. The handling of traffic from a high-power station, on a clear channel, or the sporadic use of a transceiver over a five-block path on Channel 11, does not tend to cultivate it. It blooms only under infernal interference, is fostered by sickly signals, and feeds on heavy doses of adverse band conditions and static. Yet most of us who have acquired a modicum of Radiomanship never fully realize it, much less understand it. What makes a ham select one specific band, at one specific time, to make a certain specific long-haul contact? Experience? Partly. Propagation theory? Partly. Skill? Not necessarily. A sixth sense derived from long hours of observation plus an inborn hunch? Undoubtedly. Have you ever noticed how often hamdom's top DXers can he found on a normally" dead" band, at a normally "wrong" time of day, but at the "right" time to work some rare DX who just happens to be there? Have you ever watched an experienced phone operator dig through three or four layers of QRM during Field Day to work stations whose signal substance borders on the ghostly? Have you ever noticed that the strong Sweepstakes Contest leaders always work the answering station who won't stay around if ignored? How does he know that a particular station should be worked first? Have you ever watched a v.h.f. man work DX during a meteor shower or sporadic E? He knows exactly where to point his beam; exactly when and how long to call; and under the toughest of marginal contacts, knows exactly who called him, and what was said. Have you ever noticed the touch that Radiomanship inspires? The calloused hand which cannot be trusted to dry a delicate tea cup will tune a receiver like a caress with the deft and sureness of a surgeon's scalpel. This acquired ability to woo the fickle mistress of radio communication is probably refined to its purest state by the radio amateur. He learns how to read un-readable signals, to communicate on dead frequencies, to be a radio man under interference circumstances bordering on the impossible. There are no books to learn this art form; there are no courses of .instruction which espouse it. It must be acquired in the solitary clutter of a ham shack, with the heart ranging as it will beyond the glowing window of the receiver dial. In a world where technological advancements tend to outpace the individual, where just running some device, whose design is totally beyond our ken, takes study and application, the art of Radiomanship becomes a rarer thing. When a commercial or military circuit cannot pass traffic over a given distance at all times, we provide a more powerful transmitter. The operator does merely as he must - he uses the equipment provided, or he reports that "communication is impossible due to propagational disturbances." A radio amateur, while he may have no powerful transmitter or state-of-the-art equipment, has, and is learning, the ethereal sixth sense of the true communicator. He makes do with his equipment at hand, but he bolsters his ironmongery with the feeling that such-and-such is the band to use, and that so-and-so is the time to try, and that the other station, be he at the other end of the state, the country, or the globe, will be waiting for him at that precise kilocyclic intersection. In this day and age, a tape recorder or a computer can talk; but it still takes skill to communicate.